Hello, Sweet Sisters in Christ! 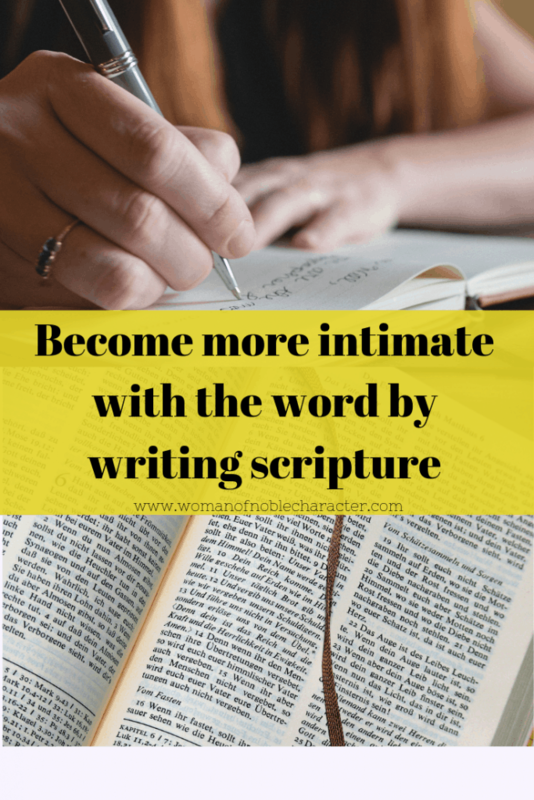 Do you include writing scripture in your quiet time with God? If not, you may want to consider adding writing scripture to your worship time. Each morning, I read a short devotional and write that day’s verses in my journal. Then, I pray over them and ask God to reveal to me what He wants me to learn about His Word. It has impacted my faith life immensely. Writing scripture helps me to focus on the verse and remember it, writing it in my heart, as well. Writing scripture forces us to slow down the process of reading and encourages reflection on the Word. 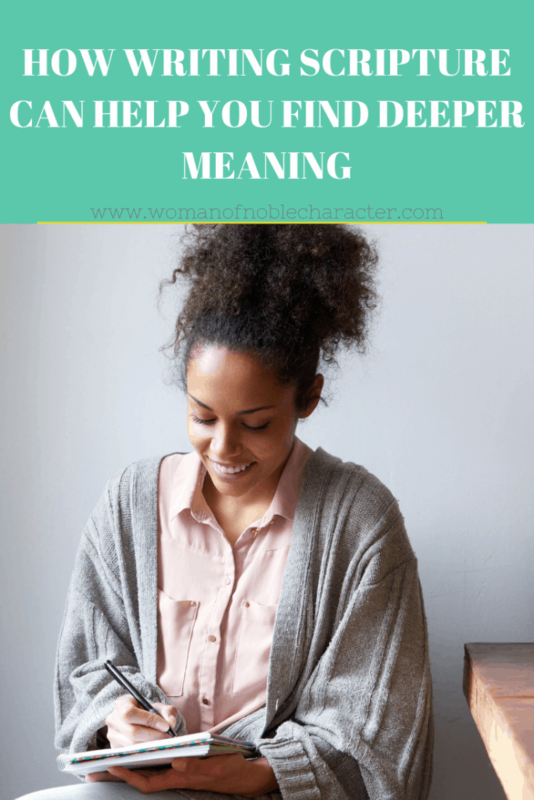 It gives us expanded time to digest what is written and focus on the meaning and how it applies to your life. Often, we read quickly and can’t recall what we’ve read – even a few minutes later. 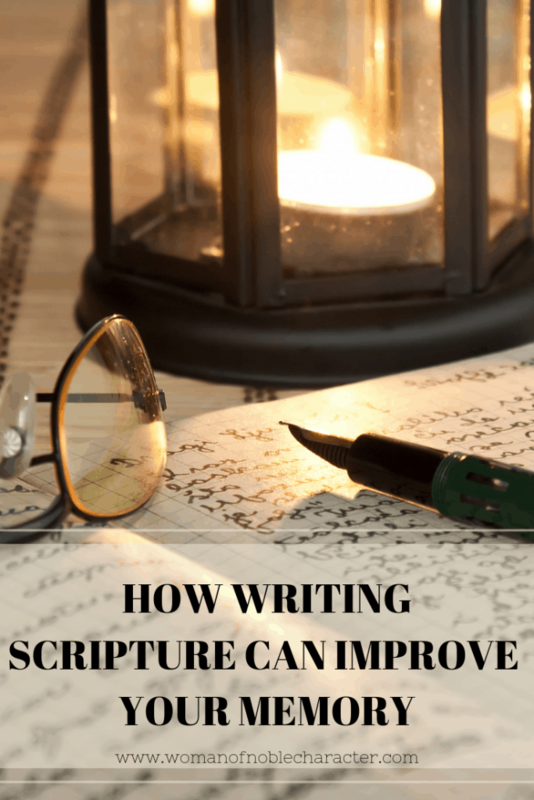 Writing scripture helps us slow down and read for deeper meaning. When I was in college, I would write nearly entire chapters of my textbooks when studying for an exam. Handwriting helps with memory and can be particularly helpful when memorizing Bible verses. For thousands of years, there were scribes, whose sole job was to pass on God’s Word by hand writing the Bible (they were the first “copy machines”!) 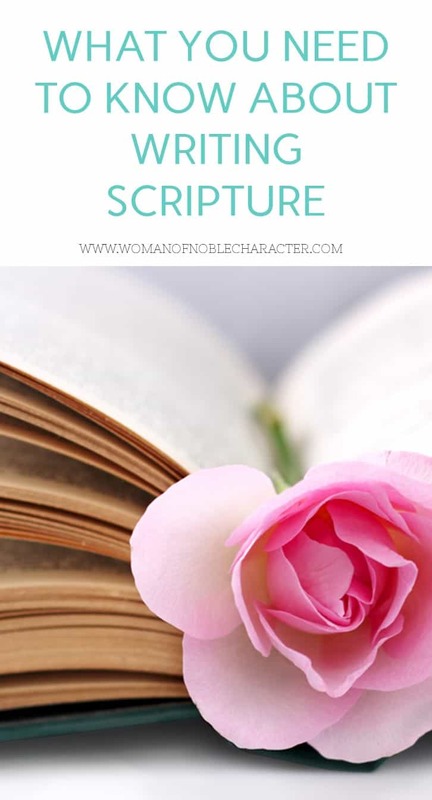 They also became intimate with the Word by writing it and were revered for their knowledge of Scripture developed through copying the Scripture. Monks have also been tasked with transcribing the Bible, devoting their lives to studying and living out God’s Word. 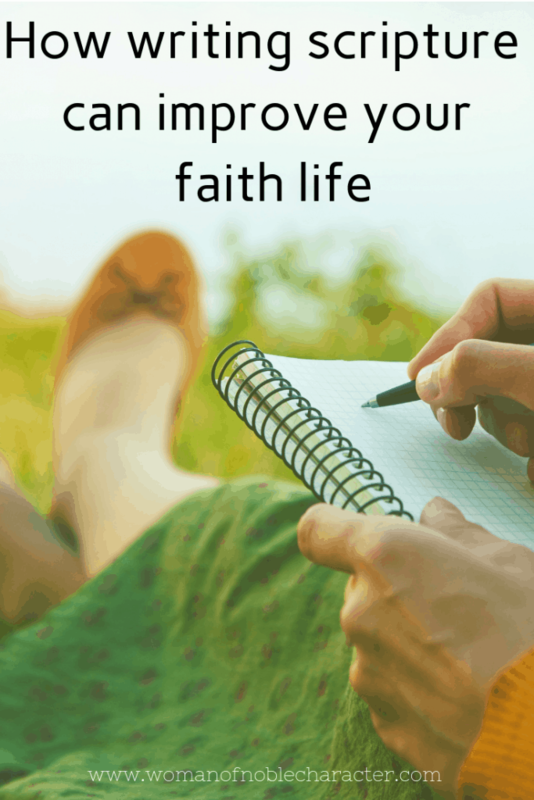 When we include writing scripture in our faith walk, we mirror the practices of these scribes and monks and can gain the same spiritual benefits that others have gained. Yes! 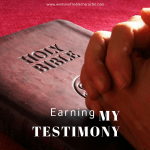 Please send me the Free Bible Study Worksheets! In Deuteronomy 17:18-20, we see a command for the Kings of Israel to personally write out their own copies of the Bible. When he takes the throne of his kingdom, he is to write for himself on a scroll a copy of this law, taken from that of the Levitical priests. It is to be with him, and he is to read it all the days of his life so that he may learn to revere the Lord his God and follow carefully all the words of this law and these decrees and not consider himself better than his fellow Israelites and turn from the law to the right or to the left. Then he and his descendants will reign a long time over his kingdom in Israel. – Deuteronomy 17:18-20. A king could have easily had a scribe do this for him, but followed the command of the Bible and wrote out their own copies. Can you imagine how long it would take to hand write the entire Bible? Can you also imagine how much more intimately you would know God’s Word if you did this? All you need is your Bible, a journal and a pen. I encourage you to start writing scripture (if you don’t already) and include it in your quiet time with Lord. Your faith and knowledge in the Word will grow exponentially. 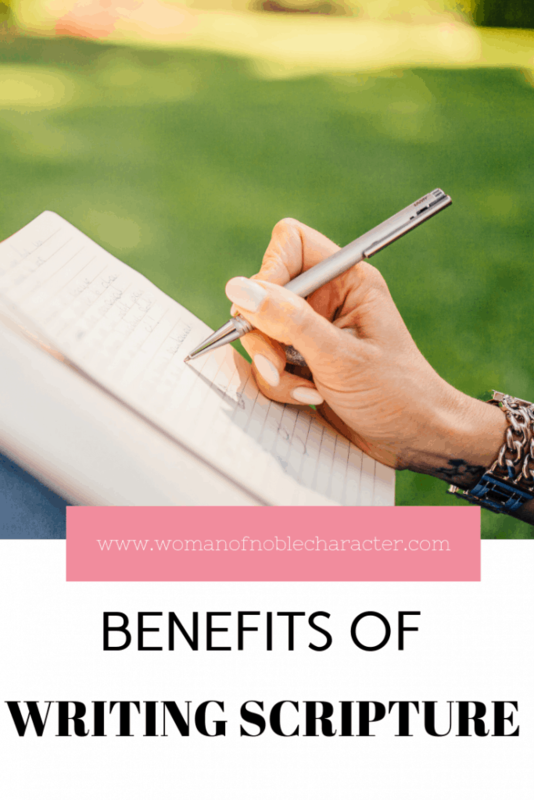 For Fifteen Benefits of Reading the Bible, check out this previous post. Hi Sue, I found your article on Pinterest and just love it. I just recently started this practice of writing the scripture out instead of writing out answers to some pre-determined questions in response to my daily bible reading. I wanted to practice hand-lettering and began with scripture. Just by happen-stance I noticed how much I’ve retained and reflected on the actual scripture. I think I’ll use your suggestion and begin a journal of written scripture…Thank you so much for the insight! Thank you so much for writing! I just love to write Scripture, as well. I feel so much closer to our God and His Word when I do. I’m a work in progress with lettering, but what a great idea to practice with Scripture! Thank you so much precious sister for sharing your experience in daily living as a child of God. I will begin this practice of transcribing and see the expected results. I’m still working on having a quality quiet time because I have a 10-month-old daughter and home and job to manage, BUT His grace is sufficient for me. Please keep praying for me as I do you. Hello, Olere! I know how tough it is to find quality time with God when you have a little one. Perhaps during her nap or right after she goes to sleep at night. I pray that you find the time to be in prayer and study of His Word. I know the blessings that come forth through that time with Him. I’m praying for you, sister! Hi Sue, Thank You for sharing. Like you I used to write out all my and papers in collage and would keep a personal journal for most of my younger life. I am now resurrecting this habit with my Bible study. I find that I am impacted more by Gods teachings when I write then down. It becomes more personal and meaningful. Oh! I’m so glad to hear that. Thank you for sharing and stopping by!